Dell Rapids City Hall is located at 302 East 4th Street, Dell Rapids, SD 57022; phone: 605-428-3595. Photo: William G. Milne House, ca. 1902, 508 East 9th Street, Dell Rapids, SD. 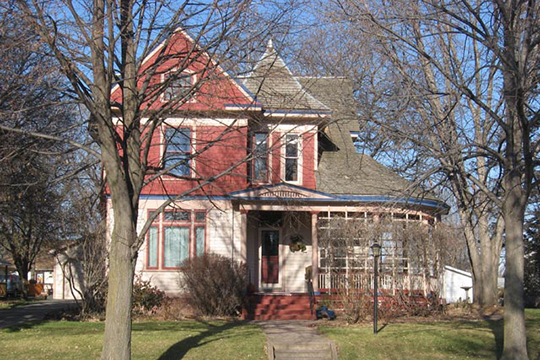 Listed on the National Register of Historic Places in 1994. Photographed by user:AlexiusHoratius (own work), 2009, [cc-by-3.0 (creativecommons.org/licenses/by/3.0)], via Wikimedia Commons, accessed March, 2016. The history of Dell Rapids begins with Peter Morse, a resident of Osage, Iowa. Although not the first person to have come across the Dells of the Big Sioux River, Morse was the first to consider establishing a town site near them. Mr. Morse first came upon the Dells while on an exploratory expedition in June 1871. Morse quickly realized the area's potential, with its fertile soil and abundant waterpower, which could be harnessed for milling purposes. Upon his return to Osage, Morse convinced experienced mill men Frank and Dennis Rice, and his friend B.D. Graves to follow him to the Dells and establish a town site. The men returned to the area in July and established a town site, west of where the business district now stands, and named it Dell City. On January 1, 1872, a Post Office was established and the town's name was officially changed to Dell Rapids. That spring the first newspaper was established, and a dam was built across the river. Later that year, the Rice brothers built a mill, a store opened, and two church congregations were formed. By the end of 1872, Dell Rapids boasted a population of nearly a hundred. Originally, the Rice brothers had envisioned gaining control of the waterpower in Sioux Falls and then built mills in Dell City, so that Dell City could become a boomtown, and therefore be declared the county seat of Minnehaha County. While this idea seemed like a good plan, it was met with several major obstacles. The first problem the Rice brothers faced was the fact that they were unable to acquire control of the waterpower in Sioux Falls. The second obstacle facing Dell Rapids was South Dakota's first senator, Richard Pettigrew. Pettigrew, a resident of Sioux Falls, wanted Sioux Falls to become the county seat, so he used his political influence to have the county lines redrawn to make Sioux Falls closer to the center of the county and Dell Rapids further away from it. Consequently, Sioux Falls became the logical choice for the county seat. Although the residents of Dell Rapids had to face the political opposition of Richard Pettigrew, ultimately it was their own dispute over where Dell Rapids should be located, that ultimately led to the town not being chosen as the county seat. Beginning in 1871, four different town sites were promoted as the location for Dell Rapids. The first plat for the town was filed on November 11, 1872, however it was later vacated. The dispute was not settled until 1874, when two of the proposed town sites were combined and promoted together as the preferred town site. The chosen town site was finally platted in 1875. Despite a grasshopper plague in 1874, Dell Rapids continued to grow. A school was established in 1873 and a ferryboat was purchased in 1874. A bridge and territorial road was completed in 1877. By 1879, Dell Rapids had grown to a population of nearly 600, so the decision was made to incorporate. The first city council meeting was held on March 24, 1879. Some of the council's first actions were to allot funds to build a bridge, a jail, and a firebreak around the town. Shortly thereafter, bonds were issued to bring a railroad to town. Dell Rapids, first settled in 1864, is one of the most picturesque towns in southeastern South Dakota. It was so named because of the dells and rapids of the Big Sioux River that flows through the town. At the southeastern edge of town are the striking and picturesque Dells, formed when the river cut a narrow gorge through the quartzite rock underlying the section. The Dells are about 0.8 miles long with several unusual formations in the distance. A well-maintained road makes it possible to drive the entire length of the Dells, but to appreciate them fully a walk along the cliff tops is necessary. Sunlight, evening shades, and moonlight all produce different and striking effects. The rock in the Dells juts to the surface through a thin layer of earth for many feet from the edge of the chasm. Below is the swift-flowing Big Sioux River, which divides into two channels above the Dells to join again below. About halfway along the Dells is PULPIT ROCK, a small amphitheater with a smooth floor of red stone at the top of the cliffs. This queer natural formation actually served as a place of worship in early days before churches were built, the congregation occasionally being subjected to a drenching because of the lack of a roof. The road passes a spot where iron rails guard a deep crevice that joins the main gorge. From natural platforms of rock south and north of this point are impressive views; toward the south, visible for a long distance, is the river valley, its walls red and purple in the sunlight. Through the gorge is a view of pastures and small groves and a glimpse of the vast prairie country. These gorges were formed by torrents which came down the Big Sioux Valley when the glaciers melted thousands of years ago. Coming from the north, the waters forced themselves over the barrier of Sioux Falls quartzite at Dell Rapids. The channel here was narrow and the rock more resistant than the drift through which the stream cut the wider part of the valley. The steep walls of the gorge are due to the method by which the stream cut its valley. When a strong current crosses a formation like the Sioux quartzite which is broken by many cracks and fissures, a process known as "plucking" takes place. Instead of being worked off bit by bit, the blocks of rock are lifted out bodily and carried away by the force of the water. The strong current of the Big Sioux River carried everything before it, including any rock projections that may have been formed, and thus left the walls smooth. The Dells are city-owned and no admission is charged. The Dell Rapids post office, established in 1871, began operations in a rude shanty with an old trunk for equipment. The town then was called "Dell" and the postmaster, Albion Thorne, played an aggressive part in its development. The post office was established on December 11th, and on Christmas the first mail arrived from Sioux Falls. Celebrating the two events, the entire population, 13 in number, gathered at Thorne's shanty for Christmas dinner. The mail carrier often made the trip on foot, sometimes on horseback, and during times of deep snow used a cutter or light sled with tall, narrow runners. A grain sack served as a mail bag during the first trips. For his first 18 months service as postmaster Thorne was paid $18. The salary of the office today is $2,000 per year. Gregory Mathias, Preservation Consultant and Lynda Schwan, South Dakota State Historic Preservation Office, Dell Rapids Residential Historic District, Minnehaha County, SD, nomination document, 2000, National Park Service, National Register of Historic Places, Washington, D.C.